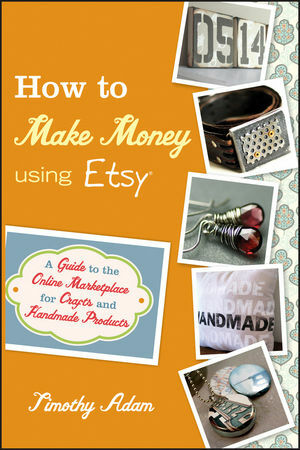 Chapter 1 All About Etsy. Etsy Defined - Etsy terms you should know. Chapter 2 Getting To Know You and Your Product. Chapter 3 Your Etsy Shop Set up. Chapter 4 Listing Your First Item. Where is the Etsy title tag found? Chapter 5 Four-Step Game Plan For More Views. Chapter 6 Advanced SEO For Your Etsy Shop. Increasing your Google Rank with Quality Backlinks. Chapter 7 Handmade Blogging Essentials. Essentials for Blogging in the Handmade Scene. 20 Tips for Handmade Blogging Success. Chapter 8 Twitter For Etsy Sellers. Quick Twitter Terms You Should Know. Chapter 9 Facebook For Handmade. Fan Page versus Personal Profile. Fan Page versus Facebook Groups. Promoting Your Products and Links on Facebook. Promoting Your Facebook Fan Page. Chapter 10 Top Etsy Seller Interviews.